Nature’s Academy has entered a cross-regional water quality collaboration with the Gulf of Mexico Coastal Ocean Observing System (GCOOS) and the Galveston Bay Foundation (Texas). GCOOS is launching their Integrated Water Quality Network project, which will serve as a citizen-collected data repository. 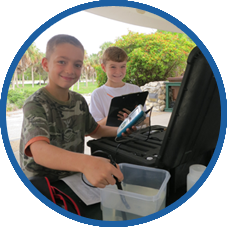 Nature’s Academy and the Galveston Bay Foundation will be the first two organizations participating in this pilot project, allowing students in Florida and Texas to see and compare each other’s data on water quality, biodiversity and coastal cleanup efforts.